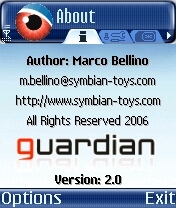 Guardian is the new antitheft system for Symbian Series 60 devices. Every time you switch on your mobile telephone, Guardian proceeds with authentication of the inserted sim card; if authentication fails, Guardian send a notification sms message to a previously set telephone number. In addition, the system features remote control functions, i.e. deleting your photographs/phone book/text messages/video/audio data in case of loss or theft of your mobile phone (see Plugins section). Please NOTE that all the sms sent / received by Guardian will not notified in any way to the user, no icons, no lights, no sounds, no vibro, nothing visibile in inbox/sent/outbox messages folder, and of course, no traces left in logs. Guardian automatically sends an sms notification about the change of the sim card containing additional information (new owner’s phone number, GSM cell ID of the terminal to which the telephone is connected, country ID and current network). Such sms messages are sent without notifying the new user. Guardian autoruns every time you turn on your mobile phone; to be fully operative, users simply need to install it and set it up. When an unauthorized sim card is inserted (or in case the mobile phone is turned on without any sim card inserted), the program will switch to invisible mode (and therefore will not be accessible anymore). The new user will not be aware of the presence of an antitheft system. When an authorized sim card is inserted, Guardian will return to visible mode. This feature has been removed as requested by F-Secure, to avoid possible software misuse as spying tool. For informations, doubts or questions, DO NOT contact me, write directly to F-Secure. Guardian includes multilanguage features; Just download the correct version for your language. 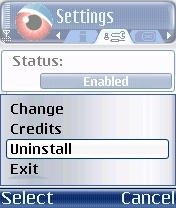 This feature protects the system from unauthorized uninstallation. The program is not visible among the installed programs; to be uninstalled, a specific procedure is required, which may be accessed from the program only. Modern mobile devices are equipped with a procedure (hard-reset) which allows to restore default settings (removing every installed software). Similar antitheft software programs may be blocked by using this procedure. Guardian features an advanced shadow copy system; in 90% of cases the program is not deleted after a hard-reset. During the day-to-day usage of the phone with an authorized SIM, Guardian will not use any memory resource, and it will not even run in the backround. The program will start every time the phone is turned on and if the SIM is authorized it will simply turn off without wasting any resource. Once a sim card change has been notified, users may send sms commands to Guardian. 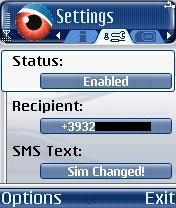 - Recover your sms and your Phonebook's contacts from your stolen mobile. - Gain informations about the thief, monitoring his activities like sent and received sms, incoming and outgoing calls, phonebooks contacts added. - Track the movements of your mobile, using the gsm cell-id localization. - Lock your Phone or your SIM to avoid anyone using it. See Plugins section for more information. A maximum of 10 authorized sim cards can be registered. (*) The latter two features will be activated after a donation. MultiSim system and Plugin support will be activated only for those users who will contribute to the growth of the project with a donation. This software is provided "as is" without any kind of warranty and without any kind of technical support. Once your donation has been received, you will receive the instructions to receive a Donation Code. The code is univocally related to your mobile telephone and is compatible with all current and future Guardian's updates.